Select Choose Axle Short Axle 26 11/16" Long Axle/Long Spline 28 7/16"
Hi-Performance Axles are some of the strongest axles available. Made from 4340 Chromoly, these axles come in Standard Short (26 11/16") and Long/Long (28 7/16") For all early type swing axle transmissions. Sold Each . 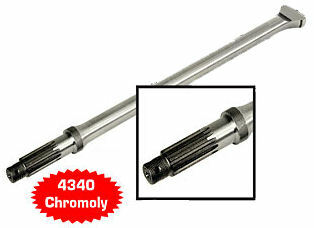 Available in Sway Away or HD Chromoly Race Trim. ****SOLD EACH**** Click more options to choose yours.